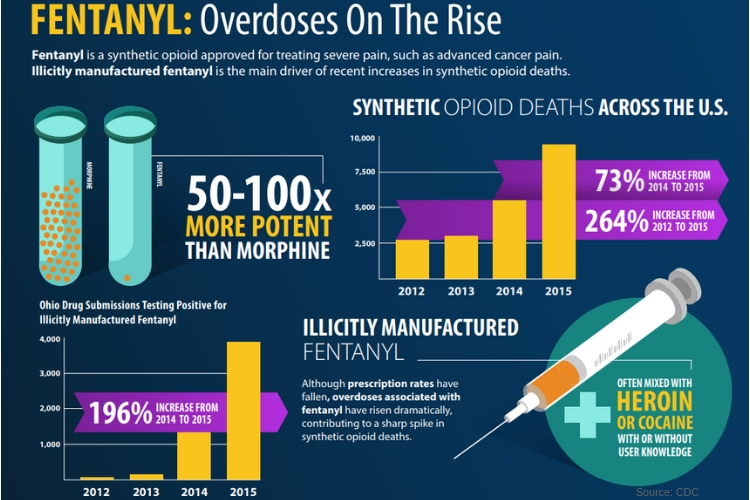 A recent report released by the US Centers for Disease Control and Prevention’s National Center for Health Statistics announces Fentanyl to be the most commonly used drug involved in drug overdose deaths. The governments report claim that the rate of a drug overdose involving the synthetic opioid took off by 113 percent every year from 2013 through 2016. According to Wednesday’s report, the total drug overdoses saw a dramatic increase each year between 2011 and 2016, with 63,632 drug overdose deaths in 2016. The stories studied death certificates for drug overdoses between 5 years and found fentanyl to be involved in nearly 29% of all deaths in 2016. In 2011, however, fentanyl was involved in just 4% of all drug fatalities. Oxycodone was the most commonly affected drug, representing 13% of all fatal drug overdoses. Heroin took the lead from 2012 to 2015 by becoming the most frequently involved drug in overdose deaths. In 2011, the number of fatal heroin overdoses was 4,571, or 11% of all drug fatalities. In 2016, that number more than tripled to 15,961 deaths, representing a quarter of all drug overdoses that year, according to the study. Deaths tripled in 2016 to 15,961, representing a quarter of all drug overdoses that year. The head authors of the report discovered that most overdoses involved more than one drug. They found that 2 in 5 cocaine-related overdose deaths also involved fentanyl. More than 20% of meth-related fatal overdoses also involved heroin, although one-third of fentanyl-related overdoses also involved heroin. The number of deaths in 2016 reaches over 18,000 due to fentanyl, and 16,000 fatalities were because of heroin. Many experts believe that the primary source of the US. Opioid crisis can be traced back to the overprescribing of prescription painkillers, although times are changing. Starting with the heroin crisis and shifting into a fentanyl epidemic. A period examined between 2011-2016 found the number of drug overdoses involving methadone has decreased. Co-Founder of Physicians for Responsible Opioid Prescribing, Dr. Andrew, cautions the public against interpreting the report as an end to the prescription drug problem. Although the Dr. was not involved in the study, he argues states such as Oklahoma, overdose deaths from prescription opioids still outnumber heroin and fentanyl deaths. During the period studied, cocaine was consistently the second most commonly used drug, and overdose deaths involving meth tripled. Experts found cocaine-related deaths completely doubled from 2014 to 2016, skyrocketing from 5,892 to 11,316 overdose causalities. The studies head authors used text analysis to evaluate death certificates for specific drug mentions. They discovered that the top 10 drugs in the six years remained the same and belonged to three classes of drug: including Benzodiazepines such as alprazolam and diazepam, opioids such as fentanyl, heroin, hydrocodone, methadone, morphine and oxycodone and Stimulants such as cocaine and methamphetamines. The study concluded that illicit drugs like fentanyl and heroin were the leading causes of accidental overdoses, and prescription drugs are more commonly involved with suicidal overdoses.